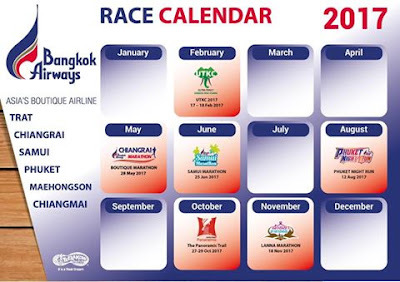 As a runner, I was pleasantly surprised when I found out that next year there will be a Koh Samui marathon 25th June 2017. Although I wasn't planning on running that many marathons again, this may be a too good of an opportunity to let pass by and I may start training in due time for a marathon once more. Currently there are not many details available, except for a date and that a marathon will be organised, but no location or route is known yet or if any other distances will be available, like a 10km and/or half marathon distance. Organizer will be Teelakow, a company that organizes various running events throughout the year around Thailand, and so far have made a professional impression on the events that I participated in or are about to participate in, like the Full Moon marathon on Koh Phangan in two weeks time, 16th October 2016. There will be more updates on this event, as soon as I find out about them, so stay tuned! 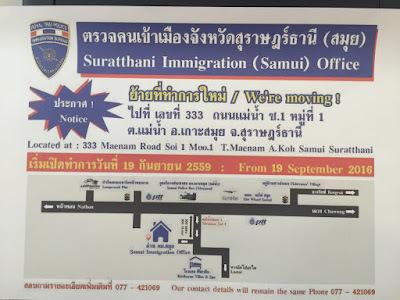 A brand new immigration office on Koh Samui has opened on Soi 1 in Maenam, finally replacing the two previous locations that I knew in Nathon, since the 17 years that I live here. Both of the two previous locations in Nathon, at opposite sides of the road, at the intersection to the Government hospital, where bursting in their seams with the work load they received day in and day out, week in and week out. The new immigration office, that opened it's doors almost two weeks ago at Soi 1 in Maenam, seems to be better equipped, or is at least more spacious than the previous locations in Nathon. It must be said though, that although the new building has been build over a very long time, it's still not completely finished, with cables and the likes still sticking out of walls or hanging down ceilings, all over public places. A quick reminder to not forget in what country we are. The staff however, seem to be efficient and know what they are doing and in my yearly visa renewal they were friendly as well. In front of the new immigration is a big restaurant/bar style place, for your drinks and possibly some small snacks and there's a short row of small buildings build, most likely to be rented out to places where you can make copies etc for your immigration paperwork that you need, but you forgot to make two copies of! Hopefully this new building will do it's job for a long time coming and for many local expats, it's a blessing that the new immigration office moved to Maenam, since it's so much closer than having to go all the way to Nathon. For all Koh Tao and Koh Phangan expats, coming in by car ferry, it will be a longer ride on Koh Samui to the new immigration office in Maenam but if they come in by Seatran or Lomprayah ferry, they will have a shorter trip to Maenam now. It's time to say 'Goodbye to September 2016' and to get down to the nitty gritty straight away, the weather during this September 2016 wasn't that great. Sure, we had sunny and warm days, especially in the beginning of the month but we also had our fair share of rain this month, more than an average September on file, since I started this Koh Samui info and weather blog back in 2007. August and September have seen a big increase in jelly fish and box jelly fish incidents around Koh Samui but on the positive side, we also see that many hotels are now well aware of the problem and the staff acts in the correct way and thus can save lives. Most of September I was back home on Koh Samui and just for the last week I left to teach a PADI IDC on Phuket and on the way over I ran my fourth full marathon distance in Khanom, smashing my personal best record by almost half an hour and now I am a sub four hour marathoner! I'm very pleased with this. We enjoyed good meals at some of our fave restaurants on the island, including Juzza Pizza. I do hope you enjoy reading my daily updates, please keep coming back and I'm looking forward seeing you al next month again, in October 2016! The next Samui Green Market Sunday 2nd October at Fisherman's Village and it's already upon this weekend! After a very successful one off location at Six Senses Hideaway Resort, it's now back to the Elysia Boutique Resort in Fisherman's Village with a 3pm start. The Samui Mala who organize Samui Green Market, now every six weeks, are excited about how the Samui Green Market has grown in numbers and diversity. They have helped some young businesses get established in the community, and every new market sees new vendors and shoppers joining and every time there's something "more" or 'new' to attract our attention. This month sees more vendors, new healers showing their stuff, as well as a loom from Isarn with a demonstration in traditional weaving. Come check it out as well as other home made, home grown products and food/ drinks including home made vegan ice cream and great chocolate. It's a fun place to network, meet others and advertise anything for the local community. If I would be on the island, I most certainly would visit, but alas, I will have to wait another six weeks again, but I hope you will have a good time and enjoy your visit to the upcoming next Samui Green Market Sunday 2nd October at Fisherman's Village. Sounds Club in Chaweng, near the Green Mango, one of the three main night clubs in Chaweng, very near to each other, Sounds, Green Mango and Solo Bar. Have you been to either one of them yet? The forecast for Koh Samui for the next ten days looks good, the wind is decreasing in strength but is not completely disappearing and the sun should break through most days with a very rare tropical shower on odd days being an option. Yesterday I posted on my dive blog about the start of the current PADI IDC on Phuket, for which we have the third day starting this morning and a PADI IDCS Instructor course started already four days ago. In front of or possibly rather opposite Central Festival in Chaweng, at the Chaweng lake area or Phru Chaweng, many evenings you can find a bunch of car enthusiastics, showing off their custom made sounds an light systems in their cars. It can get noisy when they crank up the volume! The forecast for the next ten days on Koh Samui very strong wind this afternoon and for tomorrow, after which the wind is supposed to drop but the clouds remain although we can have some sunny days. The forecast for the nest ten days on Koh Samui predicts cloud cover until Monday and a fairly strong wind until Saturday. After Monday it should clear up a bit and we may get some sunshine again. 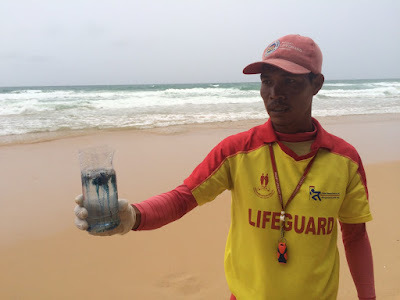 A life guard on a Phuket beach is holding a bottle with a Portuguese man o'war or blue bottle jelly fish. They washed up on four Northern Phuket beaches, Layan, Nai Thon, Nai Yang and Mai Khao and which were consequently closed for one week to all public. There were also washed up box jelly fish found on the same beaches. Both jelly fish are potentially deadly, hence the closure of said beaches to all public, a wise decision (read the article here). The ten day forecast for Koh Samui predicts strong wind until Friday night with heavy clouds until Monday, after this it should clear up and we might get to enjoy a lot more sunshine. Be aware of the chance for a relatively rare tropical shower. Today I will start a PADI IDC Staff instructor course, tomorrow followed by the actual PADI IDC on Phuket. The forecast for Koh Samui over the next ten days sees strong wind popping up from Wednesday to Friday and cloudy skies until the weekend. After next weekend it might clear up and give way to sunnier skies. Be aware of a rare, tropical shower. We have a nice mixed bag on Koh Samui, with a partially cloudy sky but the sun unleashing it's warmth and/or heat! At 10.30am it's already 33C, it's looking like it's going to be a hot day today! Also cheers out to the X Terra participants who raced today on Koh Samui! The late update today is because I participated in the Khanom full marathon and now have time to update the blog. Now it's off to Phuket to start a PADI IDC Staff course tomorrow and the PADI IDC on Tuesday. The beach at Khanom yesterday afternoon, this morning I ran a full marathon (although the race course was one kilometer short) in 3 hours and 43 minutes, smashing my personal best with half an hour and ending third in my age group. Well chuffed with today's race results. All the three times I stayed at Khanom, it was always at the Supar Royal beach resort, where today's start and finish line was, so very convenient this time around. Yesterday saw a warm day around Koh Samui with a max temp of 33C but it was mostly cloudy with occasionally some rain. The forecast for the next ten days is looking fairly good, a bit of wind until next weekend, partially cloudy with hopefully plenty of sunshine and a very rare occasional tropical shower. Enjoy! Today I'm off to Khanom on the mainland, just around the corner of the Seatran ferry, where I participate in the Khanom marathon tomorrow morning, with a 4am start and the plan is to run it under 4 hours. A big challenge but I should be ready for it. After that I will continue tomorrow afternoon to Phuket for a new PADI IDC on Phuket. Traditional Thai dancing at Tipparat school in Maenam, where our oldest daughter is a student. Yesterday two teachers retired and our daughter preciously won a price that was handed over to her today. With two very proud parents sitting in the audience. The forecast predicts a light wind over the next ten days with sunny moments but mostly cloudy skies and an occasional tropical shower. The forecast predicts less clouds between Sunday and Tuesday but all other days in the ten day forecast look like they are cloudy and occasionally accompanied by some rain. The forecast didn't change that much, come Sunday the wind should have faded and the clouds mostly disappeared. Up to Saturday expect tropical showers with possibly strong rain Saturday afternoon and sunnier skies after the weekend. Death wish at Soi 1 in Maenam (the road that connects or short cuts between Maenam and Lamai). This is one of the many off road jeeps that are being used by companies that offer trips around the island during which you visit many attractions on Koh Samui. On top of their roof they also have seats, in which sometimes up to four people sit. If the truck or jeep suddenly needs to abruptly break, the people sitting on top of the drivers cabin will be catapulted straight forward, on the road or into the back of whatever is in front of them. Each year people die like this and as far as I know, to the best of my knowledge, it is prohibited to sit on top of the drivers cabin. You don't see this anymore on the main roads, but it seems that as soon as they get off the main roads, people are allowed to sit on top again. Have you seen this? What do you think of this? The forecast predicts the clouds to break up and disappear by Sunday afternoon, the wind should have had it last breath on Saturday and up to Saturday night we may see and experience some showers. From Monday onward it should clear up and sunny skies should be ours although a tropical shower may still drift by occasionally. The forecast has changed slightly and for the next ten days, expect a fair breeze until Saturday, rain between Wednesday and Friday and sunny skies as of next Monday. A view from the hills and mountains behind Maenam, with a view towards Fisherman's Village. The last two days I was marking the race course for next weekends upcoming trail and bike races as part of the X Terra event, next Sunday, 25th September. It was the first time I hit these trails and it was awesome, first of all, I now have some good trails to run on and secondly, some of the views are just stunning! The forecast is looking good, we should have partially cloud covered skies until Friday. By Friday the wind should have dropped pretty much completely, and the sun should come out in a fairly strong force. Between and including this Wednesday and Friday expect some rain. The forecast didn't change too much for the next ten days, a bit of wind and cloud cover with an occasional tropical shower until Friday when the wind should drop and the clouds should mostly be gone. Next weekend might be sunny and hot! The forecast predicts fairly cloudy skies with strong winds until Thursday with some hard rain expected late Tuesday and Wednesday. From Friday onward the wind should drop and the the clouds should become a lot less and we may enjoy some sunny days again. The forecast for the next ten days sees a fair amount of clouds moving in and the wind picking up until Thursday, after this the wind should disappear together with the clouds and it should become really nice and hopefully sunny. This shop can be found in the middle of Nathon, between the beach road and the main road. In this shop you can buy school clothes and all kinds of stationary plus loads of non related things. This used to be the only or one of the few shops on the island where school uniforms and school related things could be bought, for all schools around the island. Now there are more shops that carry similar merchandise, let alone the big shops like Tesco Lotus and Big C. In my early Samui days, I visited here a lot, since thsi was one of the few shops were you could have papers laminated, some 17 years ago. I drove over with my bike to laminate a bunch of papers that I used whilst teaching scuba diving on the boats. Those were the days. The shop will now be renovated soon, I wonder what it will look like afterwards. Another little bit of Samui's history biting the dust? The forecast for the next ten days is looking good. Some partially cloud covered skies with the wind fading come Tuesday but Tuesday afternoon and Wednesday may see some hard rain. Bangkok, Hanoi and Saigon and now soon to be in Chaweng; El Gaucho, Argentinian steakhouse. Under construction. A logical order of cities? The forecast hasn't changed that much, mostly cloudy but with chances of sunshine, a fair bit of wind and a lot less rain is now expected over the next en days, besides an occasional tropical shower. Our newest family member, Jim! He was added about a month ago to out home in Plai Laem and he is now about three and a half months old and he's doing fine! Exploring the garden, ripping up our shoes and just enjoying each day. The forecast for the next ten days predicts fairly cloudy skies with a stiff breeze and an occasional tropical shower. Not exactly the nice September weather you would hope for and expect. The forecast is not looking as good anymore as it was a few days ago, instead we are facing fairly cloudy skies for the next ten days with string winds at time and a good chance of tropical showers. Due to one of my last long runs in preparation of a full marathon race in two weeks time in Khanom on the mainland, today's weather update is a bit later than usual. The forecast is predicting a mix of fairly cloudy to cloudy skies for the next ten days with plenty of wind and an occasional tropical shower. Wall painting in a bar at the nightlife area around the Green Mango area in Chaweng. The bar is being renovated and the painting will most likely be lost. The forecast has changed and currently the next ten days look like they will have a moderate wind with fairly cloudy skies and an occasional tropical shower. Te forecast for the next ten days predicts the skies to clear up a bit and we can expect fairly sunny skies with next Friday a very cloudy day with some very hard wind at times. Besides a possible tropical shower it should remain mostly dry. The forecast remained the same, with some heavy rain during this afternoon and cloudy days until the weekend with a fair bit of wind, but after the weekend, it should clear up and sunny times should come Koh Samui ways. The forecast is looking good, after today's predicted wind and rain the wind is supposed to drop and the clouds should move on, giving us sunny skies after the weekend. Possibly there may may still be some drizzle tomorrow.